The Now Age cannot be named, for once named, it becomes part of a fixed moment in time, and is thus lost. It is not to be confused with the New Age, because there is nothing new about it. It is, always was, and always will be. In the process of writing this, the Now Age will have already eluded itself. The process of reading will vanquish it entirely. The modernist movement of the late 19th and early 20th centuries was the final cohesive chapter in the culmination of linear history. When post-modernism was ushered in following WWII, philosophical and aesthetic movements ceased to develop according to linear trajectories, and instead diverged into a multifold network of parallel and intersecting paths. But even the end of linear time has an ending. In the beginning of the 2nd millennium A.D., it became apparent that the aesthetic impulse   was one that was less and less engaged in direct dialogue with the present and more and more haunted  by the icons and vernacular of the past (now doomed to reincarnation under the veils of Kitsch and Nostalgia). ...From this partial womb, Ghost Modernism is born. The sonic landscape of Ghost Modernism is littered with the detritus of past musical movements and guided by the phantom limbs of its revolutionary leaders. Recent technologies have made the graveyard all the more accessible to the living. The linear trajectory of time and all of its cremated entrails are sprayed across the vast fields of the World Wide Web, offering residents of this age a unique opportunity to experience multiple times simultaneously, never having to fully commit to one era or the next. The World Wide Web thus serves as a portal to commune with the spirit world, offering an opportunity to experience both past and present in real time, almost morphing into a means to remember. Music of the ghost-modern era has consequently thrived on this artificial platform of memory, becoming an extension of an ever-expanding archaeology of reference points and nostalgia. A new system of “zombie” sonic and visual aesthetics* is created based on a half-resurrection of relics of past tastes. The concept of a multi-dimensional temporal platform of sharing information is nothing new in the evolution of human consciousness. It is an ancient concept that has been embraced by many Eastern and occult philosophies for centuries. The advent of the Internet has merely granted us  an externalized paradigm of being able to exist  in multiple virtual dimensions simultaneously. If internalized symbolically, the possibilities can take on  a wholly mystical dimension. However when the symbolic value of this paradigm is lost, its current manifestation brings with it certain dangers. When one ceases to distinguish between the original and its ghost, he becomes Possessed and is no longer able to be receptive to the ecstatic state. The Death of the Original and the Decline of Symbolic Power are irrevocably linked as each time a periodic creative gesture or musical style is imitated, its vital force is diluted and the original symbolic impact of the action dwindles. Once the historical reference points are exhausted,  bands begin to imitate the imitation, and thus music history is doomed to eternal repetition in which each succeeding action becomes more and more meaningless. (a creative movement that draws inspirational strength from the past in order to better connect to the ecstasy of the present) so much as it is a nihilistic path of distraction from the source. The latter is a destructive movement that draws strength away from the past in order to dislocate further from the present, becoming increasingly unable to respond to it in an original and meaningful way (ie recapitulating it via Kitsch and Nostalgia). between time and space and resurrect the symbolic power of music by means of UTOPIA. Somewhere between Time and Eternity lies a dimension called Hyparxis**. Hyparxis is defined as an 'ableness-to-be'. It does not indicate a change in time, or a manifestation of eternity. Instead it refers to transformations in 'inner time’. Hyparxis combines what is actual with what is potential, thus creating a 'present moment' based on the internalized experience of external temporal events, past, present, or future. Thus, the Now Age refers to no age at all, but instead describes an elemental quality of being. The word UTOPIA by definition signifies “NO PLACE”. It is neither here nor there, of this world or transcendental to it. Its existence as a non-existence can be seen as a singularity, but within this “no place” exists an infinity of space. Thus an invisible “space between worlds” is created that acts as a medium between the real and the ideal environments. This aspiration for a space within a pre-existing place is vital for distinguishing the utopian impulse from the transcendental impulse; whereas transcendentalism seeks escape from the “real” world in exchange for an ideal one, utopia instead seeks a deeper connection with this world in the form of tapping into its inner potential, a REALIZATION of the REAL. It is here that the musical environment lives. Sound in and of itself is a tangible example of “no place”. and is thus (by sheer virtue of its nature) wholly meta-physical. Another means to access utopic space is by way of Symbol. Authentic symbols move the mind to a semiotic state that can be likened to a true epistemic portal,channeling the intangible through the tangible. Both forms, once overflowing with mystical significance and occult meaning, have been stripped of their symbolic power through their devolution into Kitsch. We shall use these two forms as the principle philosophical models to illustrate “the space between worlds” and hence resurrect their symbolic power. Now Age aesthetics are not based  a new system of beauty or on creating taste, but instead encouraging a new form of perceiving aesthetic and symbolic meaning within preexisting models. It is the act of seeking Beauty (Potential) through a rejection of Beauty (Actual). Of casting off the shell of the instrument (Ephemeral) in exchange for its Song (Eternal). The Hyparctic Song is the ultimate form of potentialized Beauty and lies at the core of all Now Age aesthetic orientations. Its qualities are eternal, infinite, formless, and overflowing. It doesn’t refer to any one song at all but instead a resonance, a point of reciprocal harmony between song and space, thought and action, feeling and gesture, essence and form. When essence and form are both in harmonic alignment with one another, they create a resonant relationship that activates the potentialized Beauty stored in each one in a mutual exchange of ecstasy. Any relationship between forms that recognizes this mutually ecstatic resonance between essences is an instrument of the Hyparctic Song. In Now Age aesthetics, there are no idols, icons, or deities, for that would be a veneration of the finite. While forms are necessary to construct our present reality, their aesthetic value is considered only for the extent to which they can serve as a vessel to channel the Hyparctic Song. There are no churches, synagogues, or temples. Instead all actualized structures are viewed as potentialized sacred space for the Hyparctic Song to echo. Now Age aesthetics reject identification with materials, sounds or designs fixed in a specific moment in time dislocated from their current space. Any clinging to un-contextualized nostalgic or antiquated aesthetic ideals hinders the potential for a reciprocal dialogue with one’s present environment. Now Age aesthetics embrace materials and sounds that exist in a mutually engaged and reciprocal relationship with their environment. An example would be reflective materials that catch the light from their environment and reflect it back into their environment, thus creating a feedback loop and energetic exchange between material (tangible) and space (intangible) as well as a portal between the mundane (real) and the luminous (potential). Sound is both FORM and FORMLESS. It can be recorded on various forms, but its original state of being is formless. Its paradoxical state makes it a fundamental building block for constructing the architecture of utopia. The science of cymatics demonstrates that a single tone can manifest complex geometric forms out of sand. Ultra-sonic weapon used to sink approaching ships. on any given combination of time and space, thus creating an inter-dimensional portal where intangible realities can be preserved and reenacted through tangible reality. SOUND relies on space to be actualized. MUSIC relies on time to be actualized. both rely on CONSCIOUSNESS to be synthesized. This relationship is called the HYPARCTIC SONG. Gurdjieff's enneagrams and the chromatic scale. In other words, the Architecture of Utopia relies on a construction where the HYPARCTIC SONG (infinite) and THE HUMAN BODY (finite) live in a mutually dependent relationship. In the Now Age, the music concert should serve as a bridge between worlds. This is not limited to an elite group of bands. Any band can participate in activating this potential. The concert utilizes many ancient religious strategies of icon worship, call and response chanting, group mentality, martyrdom, out-of- body experiences, and transformation  of the physical environment to create a metaphysical liminal space filled with shock and awe. It is a mass concentration of simultaneous chaos and ecstasy, a ritual sacrifice   in which the performer and audience both give their lives. Mayhem sacrifices a pig onstage. The architecture of the concert space is one to ensure that the mystical transformation of Sacrifice into Spectacle can occur. The word “spectacle” here is not to be confused with the Debordian definition of spectacle as a product for mass consumption; instead we are re-defining Spectacle as the product of mass manifestation, Spectacle as the physical manifestation of collective consciousness. The spectacle is held up by two pillars: Shock and Awe. The “shock” moment occurs when the audience realizes their existential position to the performer is not one of a passive onlooker, but of an active participant in their existence. That is, the performer is revealed to be the active embodiment of the collective unconsciousness of the audience, and in turn the unconsciousness of the audience is equally influenced by the songs   and actions of the performer. The “awe” moment arrives when both performer and audience realize that each one’s existence in this space is wholly dependent on that of the others’, and the distinction simply ceases to be. Time ceases to pass. The architecture of the space itself ceases to be. The Many and the One fuse together in either chaotic frenzy or ecstatic triumph. There is no separation between internal song and external song, only Hyparctic Song. This is the transformation of the Sacrifice into Spectacle, when death of self (finite) becomes a conduit for eternity to be experienced. The mirrorball is an ornamental staple in many concert spaces and is a symbol of pure potential. With its aesthetic achievement of total reciprocity between subject and environment, it is thus the closest the Now Age comes to accessing a deity. finite. It sees all, but does not seek to interfere, only reflect light into the void it is suspended in… the Now Age Panopticon. A record contains both the visual symbolism of the mandala and the acoustic symbolism of sound that is arranged cyclically in a rotation independent of the external space and time in which it is situated. The physical structure of the record contains the utopic diagram of the logarithmic spiral journey of the soul towards a timeless center embedded in the archetypal passage of the needle from the outer rim to the inner “endless silence” of the central groove. Thus, the end of each spiral journey is framed by SILENCE. Just as sound depends on empty space to resonate, the silence at the inner core of the record plays an essential part in the experience of its rotation. When emptiness is, sound can be. When silence is, music can be. Just as the record preserves time, it also preserves the end of time. The end of time preserves the Hyparctic Song. When time ends, NOW can be. 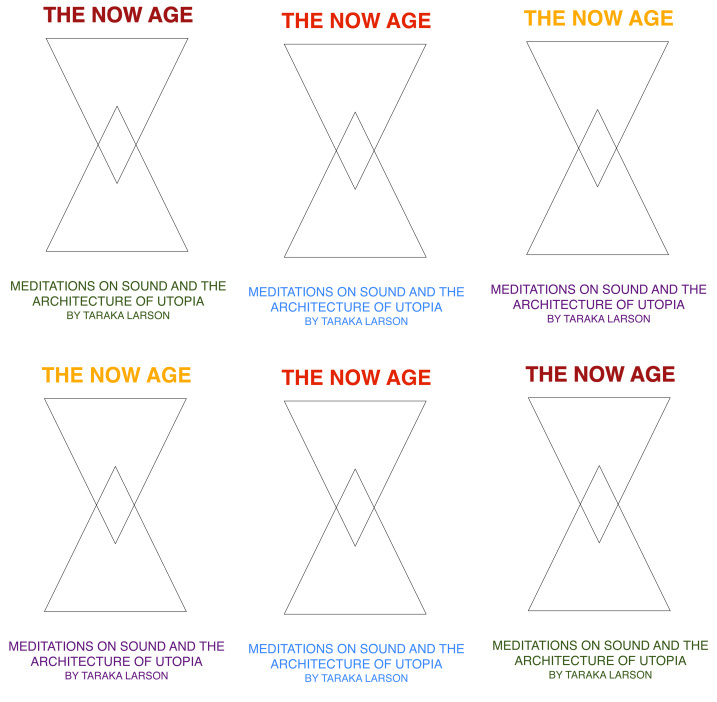 Special thanks to Taraka Larson (Prince Rama) for sharing THE NOW AGE with Red Door.